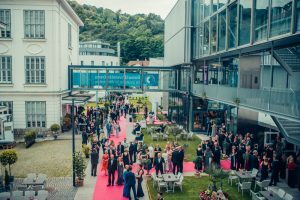 Ball of Education and Science cultural highlight in the Wachau for the fourth time! 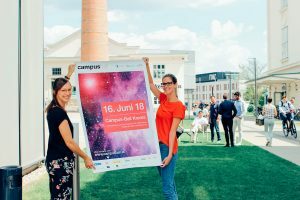 On Saturday, June 16, 2018, Campus Krems’ study and research area will once again become the scenery for one of Austria’s most beautiful summer balls. 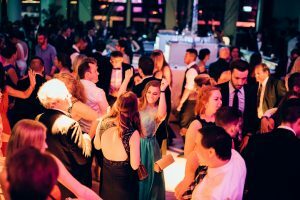 The joint cooperation of Danube University Krems, IMC University of Applied Sciences Krems and Karl Landsteiner Private University for Health Sciences, made the Campus Ball to an established event in the university’s social life. The ball provides for every taste of music: classical dance music in the ballroom, jazzy sounds in the NÖ Science Lounge and modern rhythms in the clubbing area. Further the spacious campus open-air area gives the ball a special flair and invites you to relax outdoors with a glass of wine. 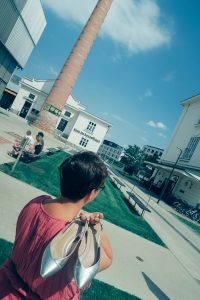 Enjoy a nice weekend in krems at Campus Ball! Check out the offers from Krems Tourism and book your stay! Harry’s spoils our guests with smoked duck, Pink Fillet, Loup De Mer, nougat parfait and many other delicacies. Secure your table reservations now – there are only few places available! We welcome all table guests with a free glass of champagne. What are you looking for, ball or football? At Campus-Ball Krems you can’t go wrong. We are going to stream the world championship matches in our Chill-Area! Click through our interactive map to find out all about the program at Campus Ball. In less than 2 weeks we would hope for beautiful weather just like today, for Austria’s most beautiful summer ball. 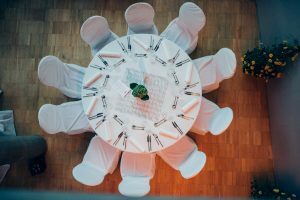 You only need good dancing shoes and a nice outfit… tickets for seated places are selling out – secure your table reservation online, to get seats at the gallery or in the ballroom, and celebrate with us the ball of science in Krems! 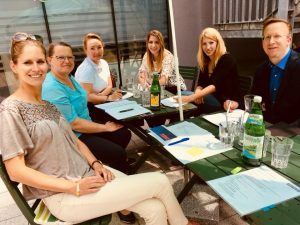 Today the organisational ball-team from IMC University of Applied Sciences, Karl Landsteiner Private University for Health Sciences and Danube-University Krems met outside, to prepare everything for June 16th! The night of all nights takes place togehter with IMC’s largest annual Alumni meeting – the IMC Home Coming. Enjoy the atmosphere of IMC Home Coming in its new sparkle! Entry for IMC Alumni and Friends starts at 6 pm with a welcome drink for free in the building G1 and IMC Alumni Award Ceremony. Again our information for you: Entry only with valid ball ticket (for for those who decide on the spur of the moment the tickets are double the price with €60 at the box office). 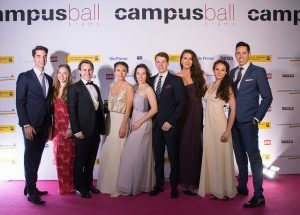 Starting May 2nd you can get your ball tickets not only only via www.campusball.at/tickets, but also purchase personally in our ball office in Dr.-Karl-Dorrek-Straße 30, Campus West. At our office we offer ball tickets without table reservations, for reduced and regular rates. Come visit us at Campus West to get your ticket! 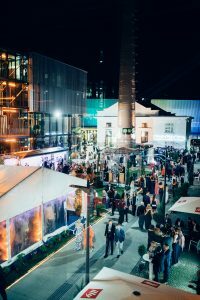 When the Campus Ball slides in its evening gown the transformation becomes visible: the teaching and learning areas turn into a vividly used dancefloor, champagne is served instead of coffee, and Wachau’s Mediterranean flair within the surrounding Kremser vineyards complete the event. Of course the program stands out for itself too: experience the bursting disco inferno with hits from the seventies plus a dance show on stage of the Clubbing Area G1, located in IMC Alumni Home Coming Events official tract. When the emerald lizard slowly wakes up after its winter rest, spring has arrived in the Wachau region. 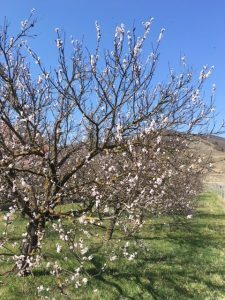 With it Campus Krems is covered in colors and buzzing noises…as for every year many visitors are destined for Wachau taking in the experience the flourishing apricot flower evokes. Springtime: time to awake, to fall in love and let Krems appear in its best colors.